Although they are a Lunar New Year specialty, Chinese American style almond cookies pair well with ice cream and summer berries. So I thought this would be a welcome recipe with the abundance of truly tasty local strawberries right now. And I am looking to catch some luck. 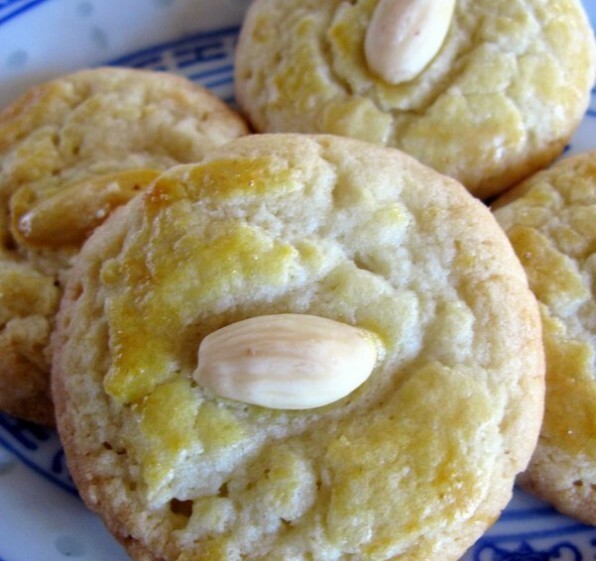 Almond cookies were once a staple at Chinese restaurants in the US. But you rarely spot them now that fortune cookies have taken over. Growing up, I spent a good deal of time in Boston’s Chinatown, one of the country’s largest. You’d see trays of these cookies in restaurant storefront windows. And the day’s menu written out in Chinese characters on paper taped to the glass. I don’t remember too much about the food because I was too intimidated to order by calligraphy. But the cookies sold themselves and I got my fill. These are crisp buttery cookies, baked to a deep golden brown to look like fat gold coins. Bearers of good fortune. Lard is authentic but I prefer butter. I developed this recipe for American Almond Products Company using their almond paste. Not only does the almond paste give the cookie a burst of almond flavor, it also adds to the cookie’s sandy texture. The large almond on top, which browns nicely during baking, adds a nice toasty almond note. In terms of technique, to retain the texture and spread in this cookie, use chilled butter and resist overmixing. If you cream the butter and sugar, you’ll end up with a cookie that spreads and looses its crumbly bite. After baking, keep the cookies out of the humidity. Freeze them after the first day then thaw as needed. Three to five minutes in a 350°F oven – toaster oven works perfectly for this- and they’ll have that just baked crispness. If you’d like a taste of old Boston Chinatown, the Nom Wah Tea Parlor dates to the 1920’s. 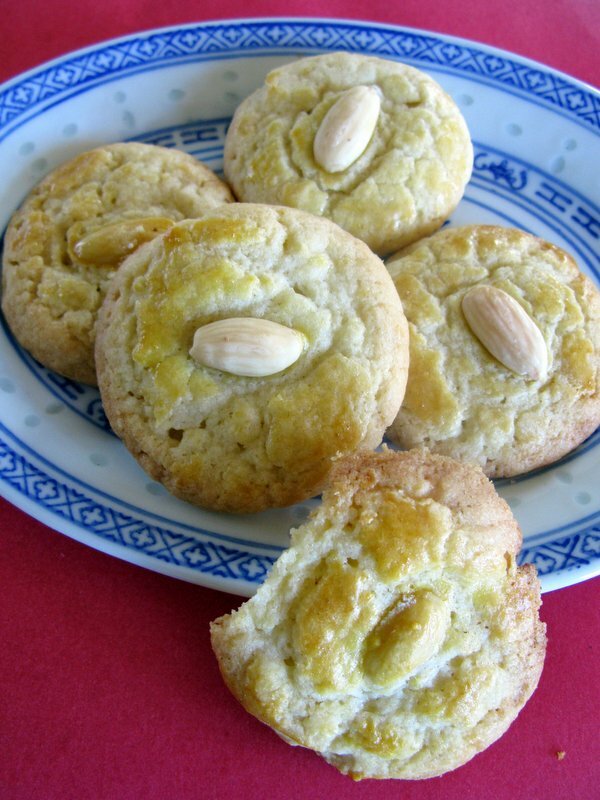 You’ll find memorable almond cookies and moon cakes here as well a full menu. We once had dinner with Julia Child and a gang at East Ocean City, a staple on the Chinese seafood scene in Boston. Crab legs the length of a forearm and whole sizzling fish. Her enthusiasm for the place was intoxicating but I have not been back in fifteen years so I can’t speak to the quality of the food served there today. Place the American Almond Products Company Almond Paste and sugar in the bowl of a mixer fitted with a paddle. Beat the mixture until uniform in texture and crumbly like sand, approximately 2 minutes. Add the butter and salt. Blend on medium speed until the butter is no longer visible and the mixture is somewhat smooth, approximately 2 to 3 minutes. Blend in the egg on low speed just until the mixture is evenly moistened. Blend in the flour and baking soda mixing on low speed only without overmixing. Scrape the dough from the bowl. Wrap it in plastic and refrigerate until well chilled, at least 3 hours or overnight. Preheat the oven to 325°F. Grease or line a couple of baking sheets with parchment paper. Brush each disk of dough lightly with some of the egg wash and press an almond into the center. Bake until the cookies spread evenly and the edges begin to brown, approximately for 13 to 15 minutes. Cool the cookies on the baking sheets for 5 minutes them remove them with a spatula to a wire rack to cool. Keep these cookies away from humidity. Freeze them after the first day then thaw as needed. Three to five minutes in a 350°F oven – toaster oven works perfectly for this- and they’ll have that just baked crispness.